Click the images below to see our printable pamphlet, or read on to see the text on this site. To request a withdrawal for personal reasons, you submit a petition to your specific college. Withdrawing for personal reasons does not require you to provide proof of your medical challenges. To request a withdrawal for medical reasons, you submit paperwork so that University Health Services can assess your condition and request a withdrawal on your behalf. College deans and advisors prefer you to request a medical withdrawal when appropriate so that they know you are getting proper treatment and are ready to pursue your studies when you return. In addition, only Tang can back date a withdrawal to the time you became ill, which can be important for fee adjustments. 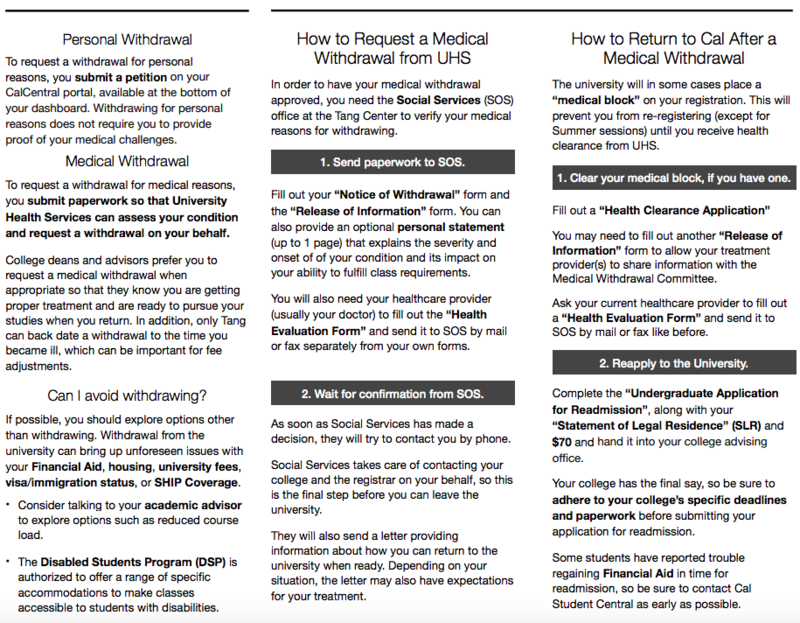 See the bottom of this page at “HOW TO REQUEST A MEDICAL WITHDRAWAL FROM UHS” for a step-by-step process. If possible, you should explore options other than withdrawing. Withdrawal from the university can bring up unforeseen issues with your Financial Aid, housing, university fees, visa/immigration status, or SHIP Coverage. Consider talking to your academic advisor to explore options such as reduced course load. The Disabled Students Program (DSP) is authorized to offer a range of specific accommodations to make classes accessible to students with disabilities. 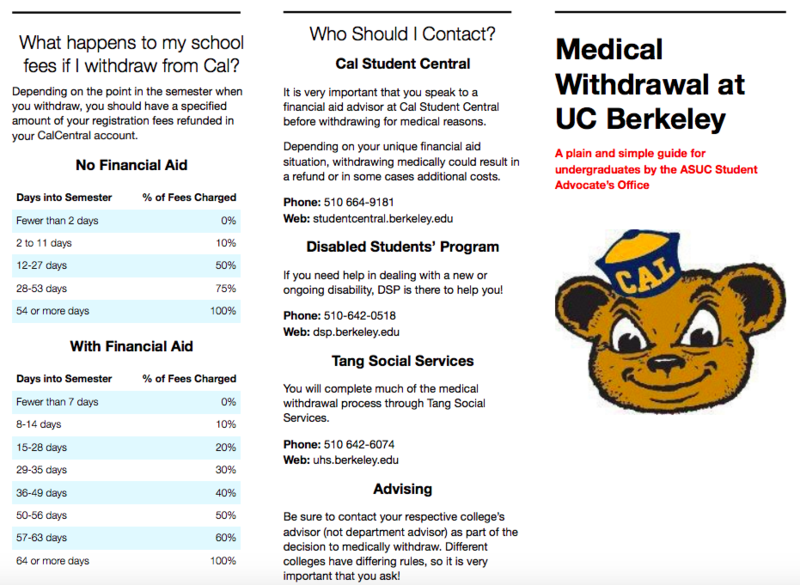 It is important to speak with a financial aid advisor at Cal Student Central before withdrawing from the university for medical reasons. Depending on your financial aid situation, medical withdrawal could result in a refund or in some cases additional costs. If you need help dealing with a new or ongoing disability, the Disabled Students’ Program (DSP) is there to help you! You will complete much of the medical withdrawal process through Tang Social Services. Be sure to contact your respective college’s advisor (not department advisor) as part of the decision to medically withdraw. Different colleges have different rules, so it is very important that you ask! What happens to my school fees if I withdraw from Cal? Depending on the point in the semester when you withdraw, you may have a specified amount of your registration fees refunded in your CARS account. 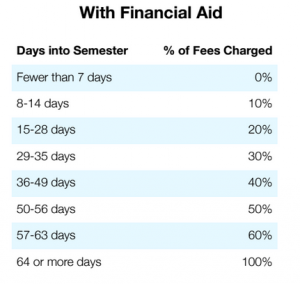 If you are a financial aid recipient and withdraw, you may have to pay back all or part of your financial aid as you may no longer be eligible for the full amount of aid. You will be held responsible for all Housing and Dining charges prior to the first day of courses and after your effective date of withdrawal, if you are still in student housing. 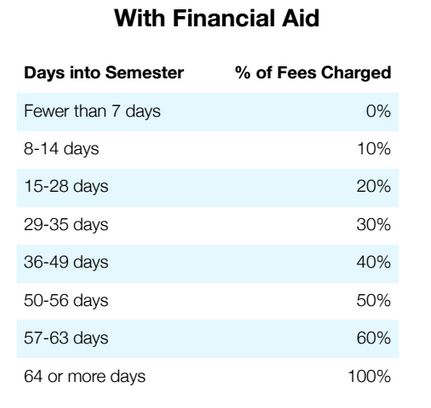 Fee adjustments, if any, are based on your withdrawal date. 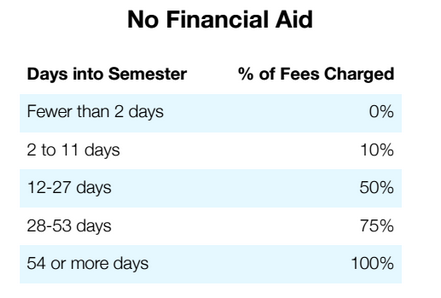 All fee adjustments for withdrawals are applied to your student account and may be applied to any outstanding debts. 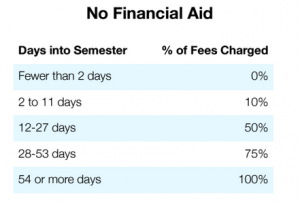 If you are participating in the Deferred Payment Plan and have not paid all your fees, you may still owe fees to the University. Please see tables below for prorated amounts. In order to have your medical withdrawal approved, you need the Social Services (SOS) office at the Tang Center to verify your medical reasons for withdrawing. Medical withdrawals are considered for the current or previous semester. To be eligible for a medical withdrawal you must have registered and paid a percentage of your fees for the semester. 1. Send paperwork to SOS. If you were treated in the community or at the UHS Counseling & Psychological Services, request that a Health Evaluation Form be completed by your provider. Your outside medical records can be reviewed with this Release of Information form. You may also submit a brief explanation (up to one page) of the reasons you are requesting a medical withdrawal. Medical Withdrawal and Readmission Forms are also available in-person at the Social Services office. All information should be sent to Social Services, along with a copy of the Release of Information form you sign, so your provider can communicate with us. The above information is reviewed to determine if the medical condition warrants a medical withdrawal. The withdrawal determination is based on the severity and onset of your condition and its impact on your ability to attend classes over a period of time. The medical withdrawal documentation is also reviewed to determine what, if any, medical documentation will be necessary for health clearance when you seek to return to school. It is common for continued treatment over a period of time to be required as a condition of clearance. 2. Wait for confirmation from SOS. As soon as Social Services has made a decision, they will try to contact you by phone. Social Services takes care of contacting your college and the registrar on your behalf, so this is the final step before you can leave the university. They will also send a letter providing information about how you can return to the university when ready. Depending on your situation, the letter may also have expectations for your treatment. The university will in some cases place a “medical block” on your registration. This will prevent you from re-registering (except for Summer sessions) until you receive health clearance from UHS. 1. Clear your medical block, if you have one. Fill out a “Health Clearance Application”. You may need to fill out another “Release of Information” form to allow your treatment provider(s) to share information with the Medical Withdrawal Committee. Ask your current healthcare provider to fill out a “Health Evaluation Form” and send it to SOS by mail or fax like before. 2. Reapply to the University. Complete the “Undergraduate Application for Readmission”, along with your “Statement of Legal Residence” (SLR) and $70 and hand it into Cal Student Central in Sproul Hall. Your college has the final say, so be sure to adhere to your college’s specific deadlines and paperwork before submitting your application for readmission. In order to make sure you have timely Financial Aid support for your return semester, be sure to contact Cal Student Central as early as possible in your readmission process.